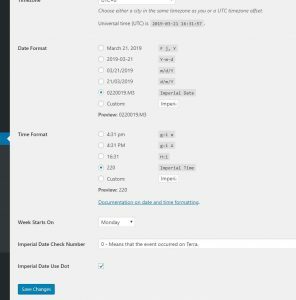 WarhammerWarhammer 40k Imperial Dating System wordpress plugin. 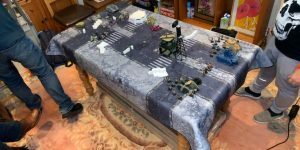 Warhammer 40k Imperial Dating System wordpress plugin. 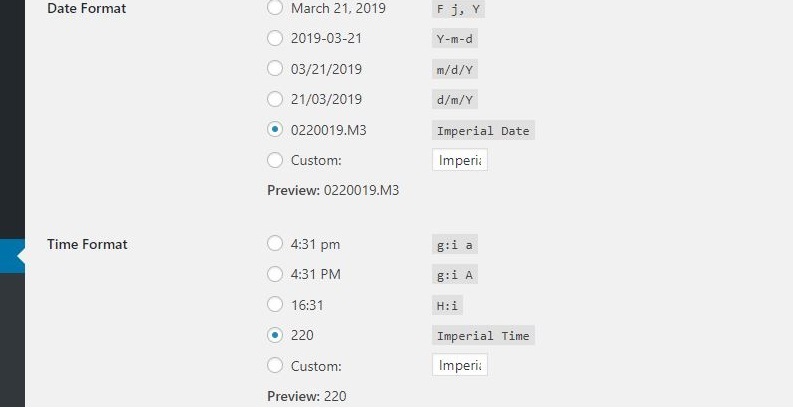 BC Imperial Date is a plugin that allows you to customize your wordpress to use Warhammer 40k pre-great rift Imperial Dating System instead of the default wordpress date. The Imperial Dating System of the Imperium of Man, also known as the Imperial Calendar was developed to deal with the vast amount of recorded history that exists in the 41st Millenium. Is almost impossible to keep accurate track of time over long journeys as this is affected by time-wrapping effects of the Immaterium and other time related anomalies. The years are based on the “Anno Domini” (AD) system. You can view the plugin source code and install instructions on GitHub or on WordPress.org. Due to common distortion of linear time that occurs while travelling withing the Warp the check number are used to compare the date accuracy in relation with time on Terra. The class 0 is the most accurate and refer to events that occurs on Terra, and the number increase based on the distance from Terra. – 0 means that the event occurred on Terra. – 1 means that the event occurred within the Sol system. – 2 means that the event occurred while someone present for the event was in direct psychic contact with Terra or the Sol system. – 3 means that an individual or organisation present was in psychic contact with a 2 source while the event occurred. – 4 means that the individual or organisation was in contact with a 3 OR 2 source. – 5 means that the individual or organisation was in contact with a 4 source. – 6 means that the individual or organisation was in contact with a 5 source. – 7 means that the event in question occurred within 10 years of the date listed in the rest of the Imperial date. – 8 means that the event occurred within 20 years of the date. – 9 class source is special. 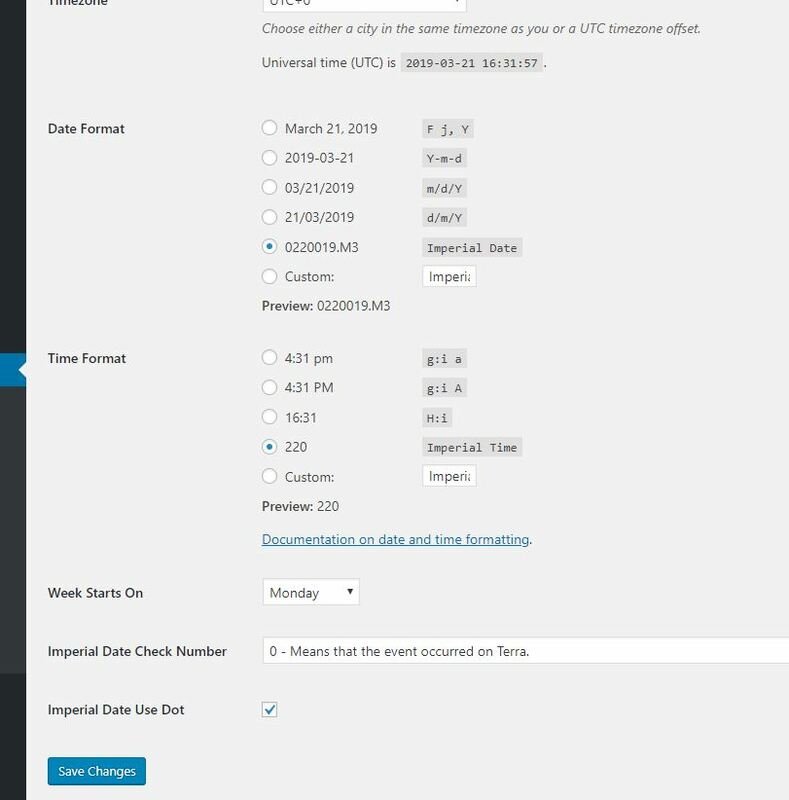 A 9-class source is an approximated date, and is usually used when recording a date within Warp travel or while on a planet that does not use the Imperial system. For record-keeping, each year is divided into 1000 equal parts, numbered 000-999, rather than months or weeks. This notation is commonly used for administrative purpose. Each increment of the year fraction corresponds to approximately eight hours and forty-five minutes Terran standard. Instead of dividing the year in approximately 365 days we dived it in 1000 factions. As an example 223 is the 223th part of 1000 parts of the year. The millennium in which the event occurred. For 2019 the millennium is M3 or the 3rd millennium. For any issues or feature request you can use Issues section on GitHub or Support section on WordPress.org .